Decoupage Lanterns | Project | Kids VT - small people, big ideas! Lanterns are a welcome way to light up the night. These upcycled glass candleholders are colorful, crafty and a cinch to make. The ones pictured here were created by 3- to 10-year-olds at a neighborhood harvest party. Thanks to the forgiving nature of decoupage, everyone produced a lantern they were proud to take home and call their own. Use scissors to cut tissue and newspaper into small pieces. We flipped through Kids VT to find fun patterns and seasonal pictures. With your craft brush, spread a thin layer of decoupage paste onto one side of a strip of tissue or newspaper. Stick the piece of paper to the glass jar. Repeat steps 2 and 3, layering paper over the jar until you're happy with how it looks. Using your craft brush, apply a thin layer of decoupage paste over the entire jar, covering every inch of paper. The paste is white when it's wet, but don't worry; it will dry clear. Set the jar in a safe place and let it dry completely. Optional: To create a hanger for the lantern, an adult can wrap a piece of metal wire once around the lip of the jar and twist the ends of the wire together into a hook. Place a tea light in the jar. 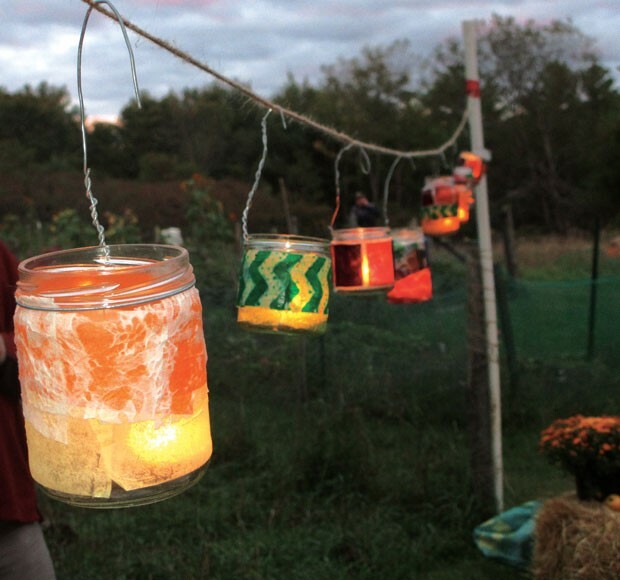 Light it up when the sun goes down for instant, artsy fall décor. Halloween tip: Line the sides of your driveway or porch with several glowing lanterns to attract trick-or-treaters.